This is another book that came about through my obsession with Terri Gross and Fresh Air on NPR. 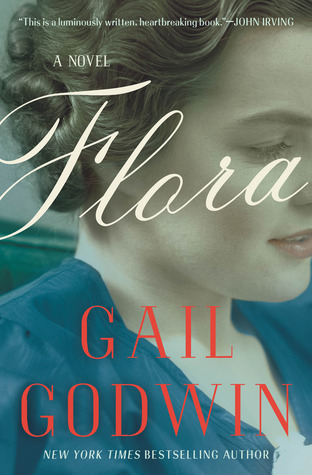 At the very beginning of the summer Flora was discussed and reviewed (click here to read/listen) and jumped out to me for several reasons. It's narrated by an adult Helen, who is looking back with remorse over her tenth summer. When her father gets a job at Oak Ridge working on developing nuclear weaponry, Helen is confined to her home with her cousin Flora as a babysitter. Due to a polio scare, Flora and Helen are confined to their remote home on the outskirts of town, to be visited only by the grocery delivery man. Helen, a child who has been forced to grow up too soon, resents Flora's intrusion and begins to act her out her resentment, culminating in disaster. Phenomenal. This book reminds me of why I love literary fiction. Godwin's characters are so real, it's impossible not to care about them. She has the perfect balance between sympathetic characters and realistic flaws. I felt like Flora and Helen were real people and the story could be true. I was also so impressed with the setting. I live near Oak Ridge and loved reading about a setting I recognize and can relate to. I was also impressed that, in addition to excellent writing, Godwin didn't lose track of her story. She manages to create an excellent story with a plot that keeps moving without sacrificing writing in the least. Again, Godwin has an ideal balance of beautiful writing and a plot line that actually goes somewhere. I was into the story, cared about the characters, and anxious to know what would happen. The writing only served to enhance my enjoyment of the story. I recommend this to fans of literary fiction who also like a plot that keeps moving. I think if you are reading ONLY to be entertained, you might find the story slow. But if you're looking for something that combines beautiful words with an intriguing story, this is a great choice. It's not a thriller, but it's got a perfectly creepy undertone that is only made better by the amazing writing. I highly recommend giving it a try.